they use the same hair stylist who LOVES red!!! Aren't they lovely, both were photographed in your garden and by you. Great. tee hee! 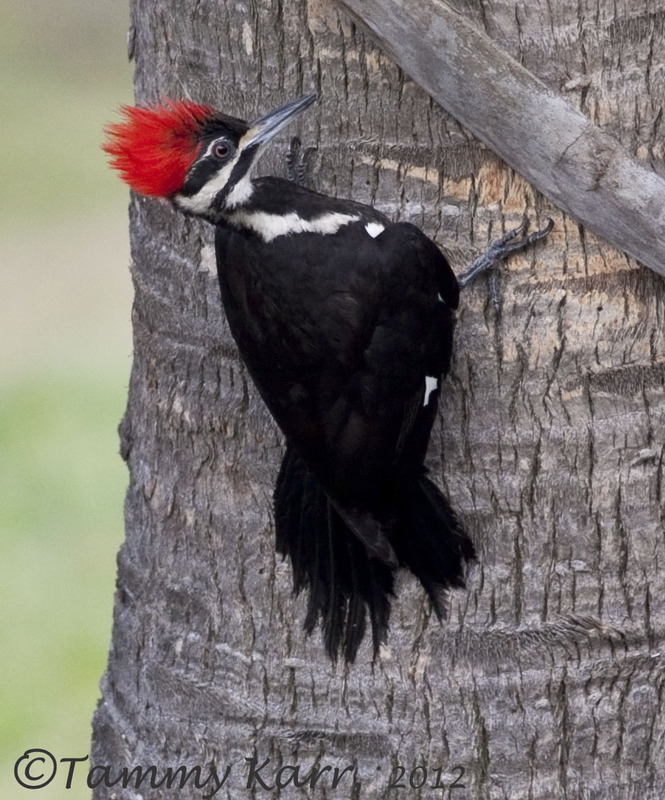 love the pileated! great shots! LOL, yes, the same hairdresser for both! Wonderful images Tammy! What a hairdoo. A spectacular Woodpecker by the looks of it. Too funny! What a wild 'hairdo' on that PIWO! Another pair of amazing birds to have in your back yard! Hmmm. The universe is trying to tell you something...but what?? Enhorabuena Tammy las fotos son geniales el ave es una preciosidad. Hola Tammy, una entrada estupenda con unas fotos geniales, te felicito. After some busy weeks, I'm back on the track again. I see you have produced a lot of amazing pics in this period. The two woodpeckers are lovely birds, not like the woodpeckers we have in Norway, but not very different. Nice again !! !Qué pájaro carpintero más curioso!, !parece que lleva peluca! Como siempre las fotos son muy buenas. Fantastic shots of the great birds, love them. I'm jealous too, wish I could see them here. Bellas tomas de esas aves que coincidenen el color rojo de sus cabezas. on a palm tree .....sounds so tropical Tammy! Here we have a park full of fir and pine trees for the pileated but they are so high up...such a good close shot you got. I like the sound they make when they call out to each other. Beautiful captures of both wood pecking red heads, Tammy. 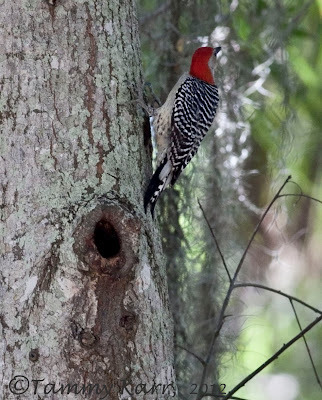 My neighbor has a red-bellied nesting in a palm tree right outside her front door.. what a surprise that was. Thanks for sharing the beauty and chuckle, I enjoyed both. Oh that is one hot looking Pileated Woodpecker... wow! Very punky indeed, this pileated! The red-bellied is very handsome! Lovely shots of peckers that still elude me here! And when at last comes an opportunity and I am just about to "shoot", a guy passes by with his dog.... Frustrating! LOL! Lucky you! Such gorgeous (though noisy) redheaded guests. Spectacular captures! I can't even get near the Pileated Woodpeckers living on our property, as they are so very shy. I am in awe of your talent! 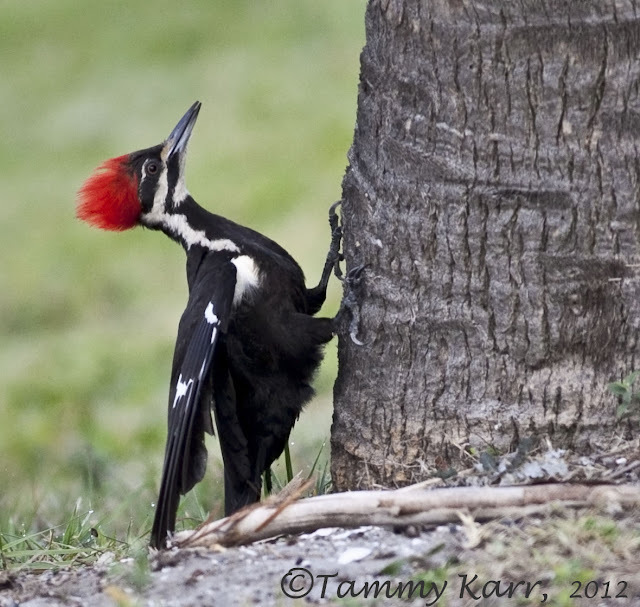 Cute scenario here, Tammy.. and beautiful captures of both woodpeckers red do's. I love your pictures and your comments about them show a great personality behind the camera. I was doing research on the coloring of the great blue heron's wings and found what I was looking for. Now I can finish the painting I am doing. Thanks for your help, Tammy.